Why settle for boring old ice cubes when you can have ice spheroids? This Ice Orb Icemaker not only makes some cool looking ice, but can also act as a wine chiller too. To make the novel shaped spheroids, simply fill the silicon shell to the marked line, insert the inner bucket and place it in the freezer. The water is kept in spheroid formation until you later pop it free as ice. 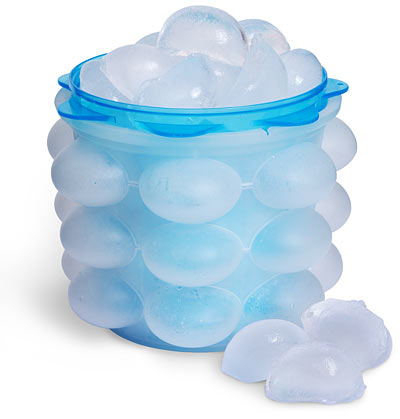 The ice mold makes 21 spheroids of ice, but even better it doubles as an ice bucket. Perfect for chilling wine, the bucket is 5 inches tall with a diameter of 6 inches. It holds a good amount of 52 ice spheroids at a time, which means your bottle of wine with be chilling in style for as long as it lasts.